TrainWeigh produces state-of-the-art train weighing equipment to meet international standards. The company offers robust and user-friendly train weighing systems, as well as hardware and software pre-configured to meet client requirements. It also provides full installation and training worldwide..
TrainWeigh also suppliers AX units for long and short-term hire, as well as lease purchase. The company calibrates and services weighing systems, including other manufacturers’ products. The company produces precision train weighing equipment for the rail industry worldwide. The AX Series portable train weighing scales ensure the safety of staff, equipment and cargo. Available in static or in-motion weighing configurations, TrainWeigh’s systems offer a multitude of tests, ranging from individual wheel weights, axle, bogie, wagon and full train weights. The AX is an invaluable piece of equipment for passenger and freight trains, as well as workshop operators and manufacturers. The AX Series can be used by train manufacturing workshops to test new and repaired locomotives, bogies and coaches. Single or multiple units provide accurate weights within 0.01%. The AX-300 can be used dynamically with individual wheel weights, which is ideal for goods and freight trains. Automatic weighing ensures correct wheel, axle, wagon and total train loadings and weight distribution down to 1% accuracy, depending on track conditions. The AXs are ready to use immediately, complete with full instructions and the tools for installation, and the company can also provide training. Lightning protection is built into the long-lasting units, which consist of robust, high-quality tool steel load cells. The systems are hermetically sealed, and therefore unaffected by adverse weather conditions, such as flooding, ice, snow, extreme temperatures and humidity. 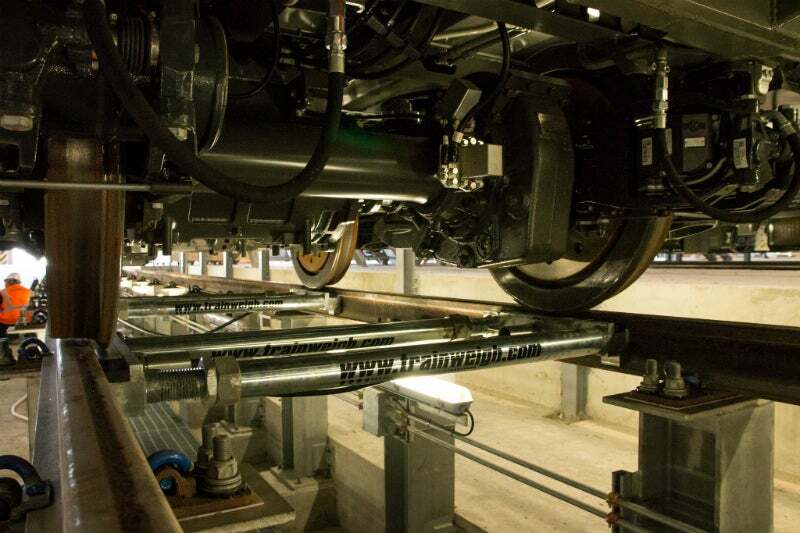 The applications prevent overloading and underloading to provide an optimal, safe and balanced load for train wagons. They also improve fuel economy for trains, and therefore offer major cost savings compared to traditional inline systems. TrainWeigh provides battery and AC power options, as well as solar-powered systems for remote locations. It also supplies the IP67 pelicase terminal, which offers an on-board memory capable of holding 100 train weights and 1,000 coach weights. An 80mm thermal printer is built into the case to give instant weight results. The derailment protection system (DPS) is an unmanned or manned system that can identify individual wheel loadings. The system will raise an alarm if any wheels or axles move out of a pre-set tolerance input by the user. Health and safety is optimised by the DPS’s built-in centre-of-gravity system, which quickly identifies load, wheel and suspension faults prior to trains leaving the depot. The DPS is especially useful for ensuring the safety of trains, carriages and cargo. All data can be stored internally on the DPS and downloaded onto a PC or USB stick, as well as printed for records to be signed off and stored for future reference. The recorded data can easily be integrated into International Organization for Standardization (ISO) quality systems. TrainWeigh offers fully approved, portable train weighing systems with International Organization of Legal Metrology (OIML) certified indicator and load cells. The company’s solutions can be used for static weighing, when all the wheels of a wagon or locomotive are simultaneously measured. This allows our customers to sell goods by weight using the AX system, which also meets Safety of Life at Sea (SOLAS) compliance for the weighing of shipping containers. New international maritime regulations require shipping container weights to be verified and declared prior to being loaded onto ships. For rail freight operators that transport cargo directly to container terminals, the Infinity train weighing system is a cost and time-efficient solution offering an in-motion, trade-approved weighing system.